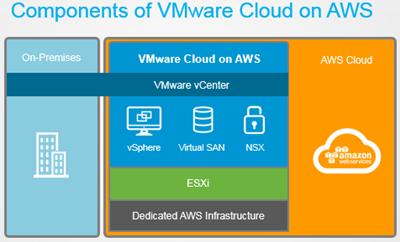 Last month VMware announced the availability of VMware cloud on AWS. The size and scale of VMware essentially means that any large-scale product launch like this is significant. Large players like this can create the trend as well as follow it. Whilst VMware has not been massively successful in the cloud space yet, their foothold on-premises is huge and therefore the market potential also. This service leverages vSphere, NSX and vSAN to allow you to run your Vmware VM’s in the AWS cloud. This is not a nested solution like Ravello, but runs on dedicated hosts housed in the AWS data center. Today this service is only available in one region, AWS west and with a minimum of 4 dedicated hosts. The ESXi hosts are beefy with each having dual E5-2686 v4 CPUs @2.3GHz with 18 Cores, that’s 36 cores total or 72 including hyper threading. Memory is 512GB of RAM and storage 10TB raw per node. Cost has been one of the most eagerly anticipated aspects of this announcement and initially there is one option which is an on demand billed per hour. This is $8.37 per host per hour, given the requirement for 4 hosts minimum this works out at a monthly cost of approx. $24,000 /month. This off the bat sounds expensive but Keith Townsend has done some analysis which shows this is comparative to running a VM in AWS EC2. In time 1 year and 3 year pricing deals will be available which will offer 30% and 50% reductions respectively compared to the on demand pricing. In terms of technical innovation VMware on AWS does not offer significant additional benefits currently v hosting on premises today. Further integration with AWS services is expected in the future. However this still offers a number of cloud type benefits such as on demand pricing and scaling. VMware are responsible for all the patching and hardware maintenance of the hosts, so this becomes like a SAAS offering of VMware with only the management of the VM’s remaining a concern. The 4 host minimum may be prohibitive to many SME’s. If VMware was able to deliver a non-dedicated hardware model this would facilitate the adoption rate by lowering the barriers to entry. It will be interesting to see if they look to a Ravello style nested system or if the performance hit of this approach is viewed as too great. The on demand pricing facilities cloud bursting, imagine a travel company that in the summer season has double demand could request and deploy additional capacity in a familiar tool. This would be powerful. From a pessimistic point of view VMware on AWS also offers CIO’s an easy on ramp for those under pressure to introduce a move to the cloud into the organisation. This new lift and shift model being offered by VMware and Ravello gives organisations a more simplified path to the cloud. Whilst re-architecting application may be optimal to leverage the architectural differences of the cloud, that is a significant undertaking. This is a 1.0 release, it seems likely additional integration with AWS will come over time plus this product brings choice to the market with another method to move to the cloud. Don’t miss any more news or tips by following via e-mail or Twitter. 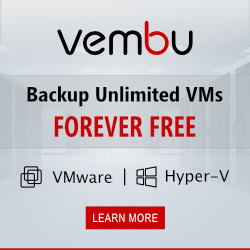 Previous Post Rubrik 4.1 – Whats New?